Legends say that the Immortals celebrated an “extravagant” banquet called the Pántáo Huí, or Feast of Peaches. In some ways this was like the Peach Festival in Candor, NC. One of the big differences, however, was that the Candor Peach Festival is celebrated every year in July and the mythological Chinese Feast of Peaches was celebrated only every six thousand years. Apparently, in the peach trees of the mythological Palace of Xi Wangmu bore fruit every three thousand years and took the same length of time to ripen. I’m sure the folks who attend the Candor Peach Festival appreciate the shorter span between their celebrations. The story of the Chinese Feast of Peaches was known so widely that statues depicting the Immortal Palace show guards holding peaches. 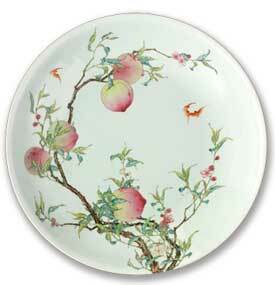 A popular subject of paintings is an image of Eight Immortals crossing the sea to attend the Peach Banquet. Fortunately, they didn’t have to hurry since they had a six thousand year lead time for the event. The legend of The Moon Goddess is a legend common to China, Korea and Japan. It tells the story of a man named Hou Yi, who crossed burning deserts, forded cold streams, and trekked over high mountains for thousands of miles to the home of the Immortals to ask for a taste of the peaches of immortality. The complete tale, according to one author can be found in its entirety here.